A friend of mine that attended today’s Dainichi Koi Farm Auction 2013, told me that Dainichi’s Most Expensive Koi went to No. 102. This Dainichi Showa was sold under auction hammer for a price of 4,000,000 Japanese Yen (equivalent to about Singapore Dollars $ 50,000 or Malaysian Ringgit RM 130,000). This is far lesser than the World Record Price for Most Expensive Auction Koi, only set recently at the Sakai Fish Farm Koi Auction 2013, for a beautiful Sakai Nisai Sanke, at an astronomical price of 21,000,000 Japanese Yen (equivalent to about Singapore Dollars $270,000 or Malaysian Ringgit RM685,000). This Dainichi Showa was one of Marugen Koi Farm’s opinion top Dainichi auction koi picks before the actual auction day. She has a lovely kuchi-sumi spot (black spot at the tip of her mouth), and large red beni wrapping on her huge body, with evenly placed white shiro and black sumi placements. 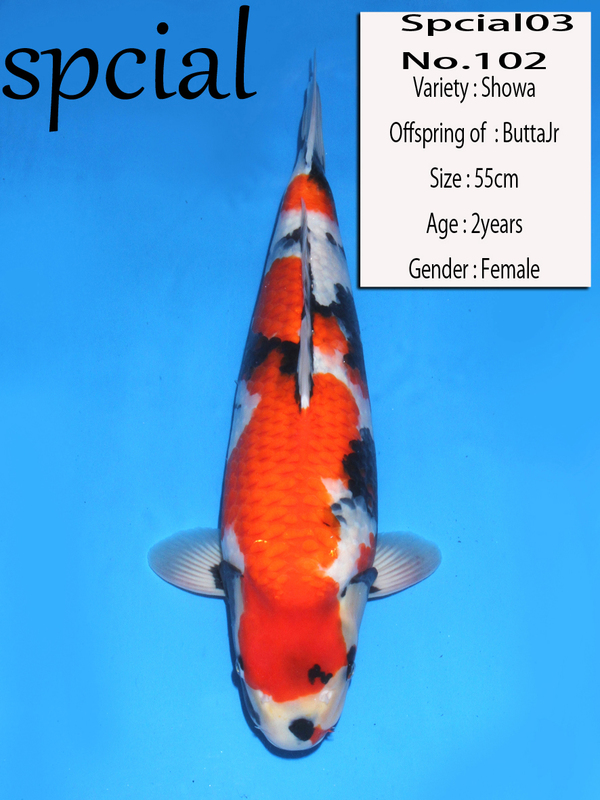 A young Nisai already at 55cm, she is an offspring of Butta Junior, and has a great future ahead of her. Will she become a future Grand Champion? Only time will tell!